abstract:The tutorial shows in easy steps, how to create an object with blender and export it as a sculptie map (UV-texture) for usage in OpenSim or any compatible online world. We assume, that you have basic knowledge about the blender user interface. But we still provide enough background information, so that even blender newbies can follow the process. The tutorial covers any recent blender-version up to the currently recommended release 2.49b. Note, that we not yet support blender release 2.5! Sculpted Prims Part II ( 10-March-2010 )abstract:The tutorial shows in easy steps, how to apply the crease-function to your model and how to create a very simple texture by using multiple materials. We assume, that you have basic knowledge about the blender user interface. But we still provide enough background information, so that even blender newbies can follow the process. The tutorial covers any recent blender-version up to the currently recommended release 2.49b and Jass2. Sculpted Prims Part III ( 2-April-2010 )abstract:The tutorial gives a more in depth introduction to the most important modelling tools in blender and shows some nice tricks for the every day usage of this tool. One highlight is the description of the primstar multi-sculptie export tool and the corresponding Multi-sculptie-Generator in your online world. We assume, that you have seen the preceding tutorial parts I and II. But we still provide enough background information, so that even blender newbies should be able to follow the process. The tutorial covers any recent blender-version up to the currently recommended release 2.49b and Jass2. 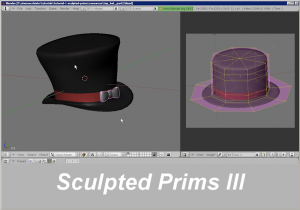 Sculpted Prims Part IV ( 08-July-2010 )abstract:The tutorial gives an insight into the texturing tools of blender. We show the secrets of ambient occlusion, how to bake highlights, How to set up the blender light system, how to use the node editor and how to create and apply bump maps. The tutorial covers any recent blender-version up to the currently recommended release 2.49b and Jass2. Texturizing sculpties with multiple images ( 01-September-2008 )abstract:This video tutorial shows a method to create textures out of multiple images for sculpted prims in your online world. We use blender-2.47 for this demonstration. No further software is needed here. Although this tutorial is self contained, you may also check our first texturizing tutorial, which may help for better understanding. abstract:The tutorial shows how to install blender. It uncovers the secrets of the blender console and it explains how to verify that blender has been installed correctly. abstract:The tutorial shows how you can customize blender to use your personal scripts location folder. This tutorial is HD-enabled. The blender primer( 30-December-2009 )abstract: This tutorial gives an introduction into the usage of the blender interface. It covers the most basic functions for creating and modifying mesh objects. The tutorial mainly adresses people, who are totally new to 3D content creation tools in general and blender in particular. After you have studied the tutorial you should be able to follow our subsequent tutorials about using blender for creation of sculpted prims. Images with Alpha-channel ( 2-June-2009 ) abstract: The tutorial describes how you can enable image processing with alpha-channels in blender. In addition to that, we also show, how you can apply your own alpha-mask to your sculpt-map for protection and for labeling your work. Note that the first part of the tutorial also applies to the Domino Design scripts, while the secnd part refers to the JASS-distribution only. Sculpted Prims for the blender purist ( 14-July-2008 ) abstract: The tutorial is a 6 minutes life demonstration, how to create a whine glass sculptie with blender, from scratch and without any(!) help of scripts. I only use the blender internal functions and show a very easy going way. This tutorial is dedicated to Amanda Levitzky and Domino Marama, who have given me all the hints i needed to eventually find the demonstrated workflow. “Sculptify Objects” ( 14 -July -2010 ) abstract:In this tutorial I will create a screw using extrusion only. The finished model is turned into a sculpted Prim by use of the “sculptify objects” script. The tutorial covers any recent blender-version up to the currently recommended release 2.49b and Jass2. “Modelling with Curves” ( 14-April-2010 ) abstract: In this tutorial I will introduce the curve-modifier and create a sculpted helix. The tutorial covers any recent blender-version up to the currently recommended release 2.49b and Jass2. “Modelling with Outlines” ( 06-Januar-2010 ) abstract: We show you, how you can start with an empty mesh, draw an outline of an object and eventually create the full 3D-model. In the final step the object will be turned into a Sculptie using some primstar magic. “I-Beams” ( 7-September-2009 ) abstract: The Tutorial explains, how to create an LOD invariant I-Beam. “2 in 1” ( 14-August-2009 ) abstract: The tutorial describes how you can create multiple objects out of one single Sculpted prim. Cubes (25-Apr-2009)abstract:abstract: a bit of fresh air is necessary. Lets go and make another cube, but now we make it almost perfect. Cylinders (28-Apr-2009)abstract:Make a closed cylinder using subsurf and Crease…. Your feedback helps to constantly improve our work. what we could do better.